Before the clean, silvery IdeaPad 330S landed on my lap, I was using the more sophisticated, more expensive IdeaPad 530S for over a month’s time. So, when I got my first look at the IdeaPad 330S, I thought it looked almost exactly like the IdeaPad 530S. The truth is, it does look a lot like its elder sibling, but it’s also thicker and slightly heavier. The model I received for review was powered by an eighth-generation Intel Core i3 processor, integrated Intel graphics, and 4GB of RAM. Using this laptop right after (and alongside sometimes) the IdeaPad 530S gave me a chance to assess the newbie with ample contrast. The Lenovo IdeaPad 330S cleverly uses polished aluminium and plastic in its construction in a way that makes it hard to tell if there’s any plastic at all. The outside, the inside, and the long hinge that runs almost across the entire width of the display bear a clean matte look. 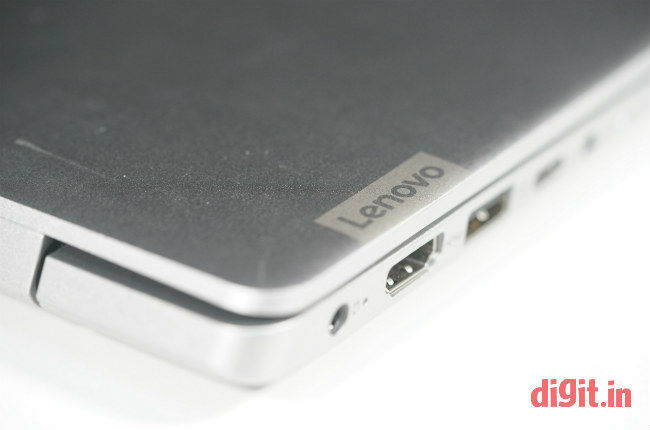 The Lenovo branding on the lid is tastefully minimal; it’s something I personally like and consider a sign of maturity in the Lenovo devices of today. With all this, the IdeaPad 330S succeeds in looking understated and premium whether it’s held in the hand or set down on a table. All edges around the IdeaPad 330S’ body are neatly chamfered. Still, there’s no guarantee the edge below the touchpad won’t cut into your wrists when you type at certain angles. The almost-flat base of the laptop is equally weighted across its sides and the laptop doesn’t feel too heavy or too light on any one side. Thin body-coloured rubber shoes on the base of the laptop keep the computer sitting firmly on the lap and on the table. The hinge of the laptop feels neither too tight nor too loose to open and shut. The display hinge opens up to an angle of over 180 degrees. This makes viewing and typing convenient while sitting at odd angles. The display on the IdeaPad 330S is a 14-inch unit. It can be had with either a regular glossy panel with an HD resolution or a matte IPS panel with a Full HD resolution. The one I received for review had the latter, and it looked positively impressive. While the display’s surface allows very little reflection, it does invite fingerprints easily. The panel is bright enough for most environments, but could have been brighter. You might find the brightness setting hovering around max many a time even when you’re indoors. The maximum horizontal viewing angle is about 175 degrees. Text is readable even when the display is pushed all the way back. Colours are neither too sharp nor too flat, and appear very natural during movie playback, web browsing, and photo-viewing. This display’s most accurate colours are blues, followed closely by reds and yellows. In summary, I believe this is a really good display for a laptop of this price. There’s almost no visual difference between this display and the IdeaPad 530S’ display, a model that’s nearly two times more expensive. The display has a high contrast ratio of 950:1 at max brightness. The backlight is consistent in terms of luminance across the screen’s quadrants and the difference to maximum brightness never crosses 6 percent. I haven’t had a chance to test the glossy HD display option, but I’m confident this IPS Full HD display is worth the extra money. If your budget allows it, don’t think twice about getting it. Audio performance on the IdeaPad 330S is respectable. The maximum volume is enough to fill a room of 10 x 15 feet up, and the speakers are capable of delivering clear sounds of string instruments like violins and cellos. Bass output, however, feels limited. The Dolby Audio utility that comes preinstalled with Windows 10 has preset equalisers for gaming, and music and movie playback, which, when turned on boost the overall pre-amp volume, along with making necessary tweaks to the equaliser curve. On the edges of the IdeaPad 330S’ body are two full-size USB ports, an HDMI port, a card reader slot, single audio jack, charging port, and surprisingly, a USB Type-C port. Unlike the elder IdeaPad 530S, this model does not feature a fingerprint scanner. Pressing any key on the keyboard when the computer is off shows a large battery percentage indicator on the display. It’s a nifty feature for when you’re stepping out and want to know if you should take the charger cable along. 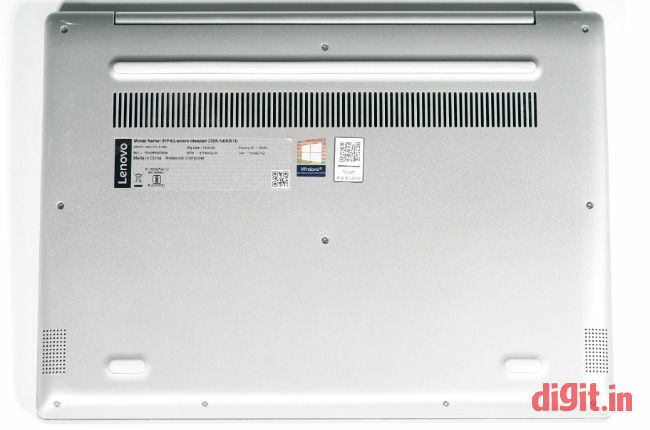 Lenovo has a history of borrowing the keyboard design from its sister brand, ThinkPad, for some of its other lines of laptops as well. 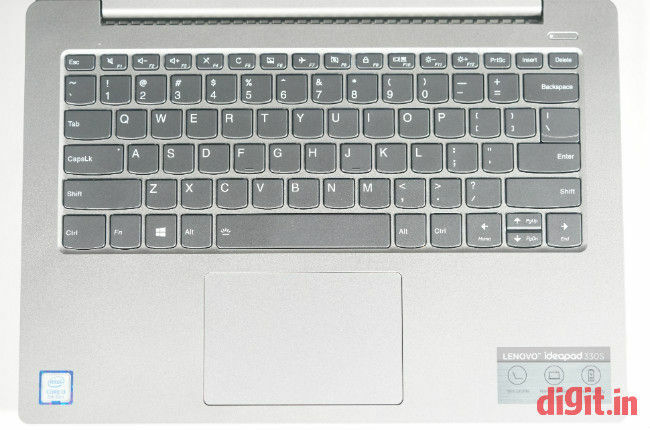 But there’s no such luck here, as the keyboard on the IdeaPad 330S is a completely different chiclet-style unit. It’s backlit and has three modes to choose from—off, low brightness, and high brightness. The keys on the keyboard are flat, but the throw is moderately deep. Tactile feedback from the keys isn’t too positive, but it is better than the feedback I got from the costlier IdeaPad 530S. I know; it’s quite ironic, but since the IdeaPad 330S is thicker, it has more space for key travel. I wish Lenovo had included dedicated Home, End, Page Up, and Page Down keys on the laptop’s keyboard. Nevertheless, these functions can be accessed through a combination of the arrow keys and the Function key. If you’re planning to use the laptop to get a lot of writing and text editing done, the lack of these keys and the fact that the feedback is average might hinder your speed. The touchpad on the IdeaPad 330S is a precision unit, which means multi-finger gestures work right out of the box without needing any third-party drivers or utilities. All touchpad settings are handled by Windows in Settings. It’s good to see the precision touchpad trickling down to mid-level and entry-level models this quickly since its inception. The touchpad responds eagerly and taps (single or multiple) are always well registered. The body-coloured surface of the touchpad is smooth. The lower half of the touchpad can be clicked for left-mouse and right-mouse clicks. Performance, it must be said, is not the IdeaPad 330S’ strong suit if it’s bought with this exact specification. This unit on review has an eighth-generation dual-core Intel Core i3-8130U processor (clocking at 2.20GHz). It’s equipped with 4GB of RAM. Storage is taken care of by a 1TB hard drive on this device. The laptop can be bought with other storage options, which include a 2TB hard drive, a PCIe SSD with up to 256GB of capacity, or a combination of both. The graphics on-board are handled by an integrated Intel UHD Graphics 620 chip. Other options are a dedicated AMD Radeon 535 or an AMD Radeon 540 graphics card. 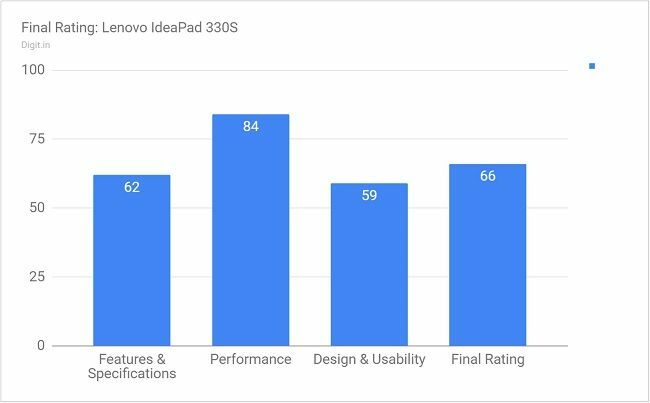 Surprisingly, the IdeaPad 330S scored remarkably good numbers in the benchmark tests. On PCMark 8’s Creative, Home, and Work tests, it attained a score higher than that of the ASUS Vivobook UX507. It was the same case with tests run on PCMark 10 and Cinebench. While things like booting, application launches, and everyday tasks happen without too much fuss, clicking on certain desktop elements stupefies the device at times. Clicking on the Windows Start button, or opening an instance of File Explorer, or even simply hovering over a tray icon on the taskbar while working on an application, can, more often than not, cause the computer to go cold for several seconds. Web browsing on Chrome or Firefox is an easy affair if you open fewer than fifteen tabs and have the patience of an oyster. Else, it could prove to be a little trying. Games are best avoided on this model, unless it’s a very lightweight platformer. Window animations worked well during my time with it, but there were a few instances when text boxes filled up with text a good second or two after typing into them. To summarise performance on this machine, I’d say opt for a model with 8GB of RAM and you should be left with plenty of memory for fat Windows and his friends, your favourite browser, and your spreadsheets and documents. Writing and looking up websites for reference while listening to soft music, an activity that involves running about fifteen Chrome tabs, an email client, OneNote, and WordWeb simultaneously, made the battery drop from 100 percent to 58 percent in a span of one and a half hours. Eventually the battery dropped from 58 percent to 38 percent in an hour with more moderate usage. Throughout the time, the display brightness bar was halfway up, WiFi and Bluetooth were left on, and the keyboard lights were on at low brightness. A total time of five hours is what one can expect from the IdeaPad 330S’s battery when it’s fully charged, which for a laptop of this price range, is not bad. Expectedly, the battery drained more quickly when I was installing applications on the computer than when I was just typing and listening to some music. Disabling Bluetooth and the keyboard lights and turning the display brightness down should give you more time than five hours when going unplugged. The Lenovo IdeaPad 330S is a modern computer that looks classy and unpretentious. It’s slimmer than its predecessor by nearly 4mm, pushing it deeper into the thin-and-light laptop category. While the IdeaPad 330S can be appreciated for its sturdy metallic build and overall maturity in design, its non-glossy bright and colourful Full HD display, decent battery life, and its precise touchpad and keyboard, it cannot be called a hero for its performance. Supposing it wasn’t limited to just its Intel Core i3 processor, 4GB of RAM, and integrated graphics, it might have fared better on the performance front too. It’s otherwise a laptop worth getting for its reasonable price of Rs 35,990.